It’s the new cable that’s catching on everywhere. We’ve told you about our Redmere cables, full of fancy new technlogy that makes long runs of up to 140′ possible without a translation device and as thin as a headphone cable. Let’s take a look and see how they stack up to a bargain priced cable from a competitor. 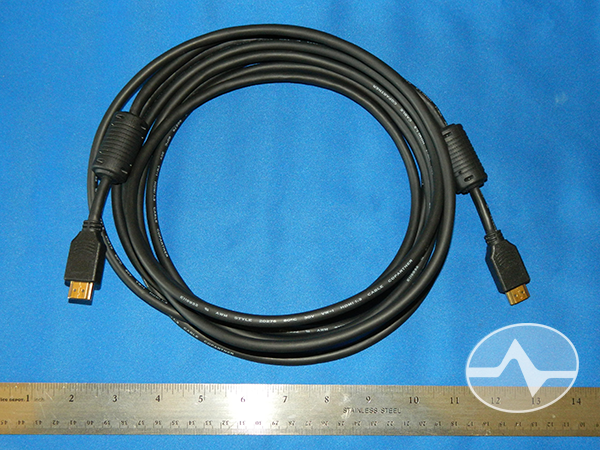 We bought a 12-foot HDMI cable from a bargain priced competitor. 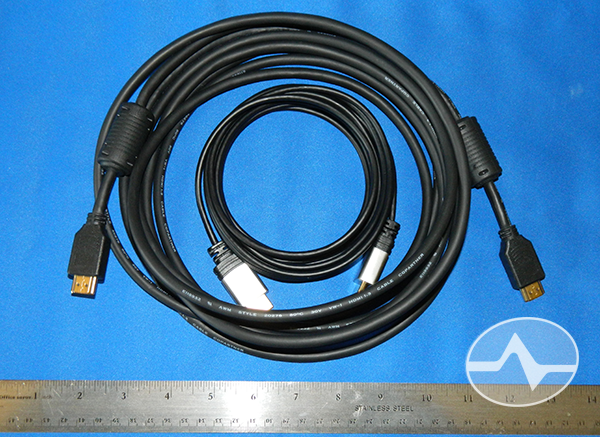 It looks nice and sturdy, although the cable itself is listed as HDMI 1.3 and we ordered HDMI 1.4. 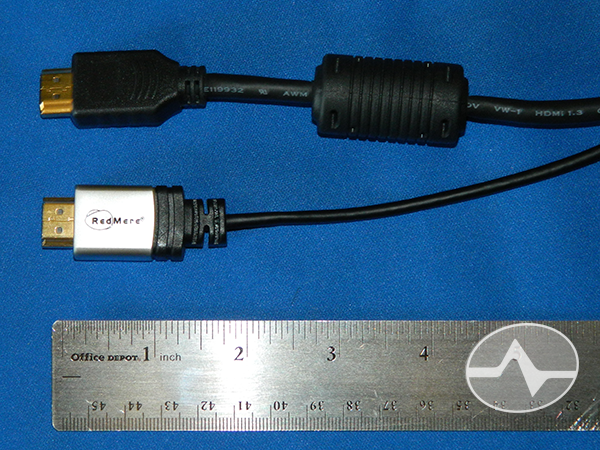 It has big, thick surge protection blocks on both sides and coiled up, it is about 12″ wide. Even though the cable said HDMI 1.3, it did actually work on an HDMI 1.4 source. Size matters, that’s all we’ll say here. The Redmere cable was no more than 6″ all coiled up and that makes a difference. It doesn’t matter whether you are trying to fish behind a flush-mounted TV or if you carry the cable with you when you travel, smaller is better. Redmere cables don’t need the heavy surge-protection rings, either. The difference between the two cables was very obvious when looking at them side by side, too. The Redmere cable makes the budget cable seem like something from the 1960s. The only positive of the budget cable was the plastic ridges on the connector which make connections easier. Both cables performed identically even on a flaky Blu-ray player that won’t work with a super cheap HDMI cable. The end with the logo connects to your TV and the other end to your Blu-ray player, satellite receiver or other device. If you have a home theater receiver, the logo end connects to that. If you connect the cable backwards, it just doesn’t work. There’s no drama there. It’s true that Redmere cables cost more and it’s also true that the economy cable performed just as well. However, when it comes to tight spaces or long runs, Redmere is definitely the way to go. 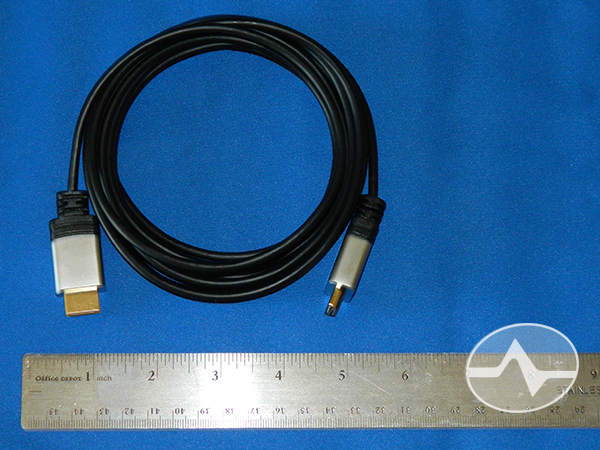 Does your next television need HDMI 2.0a?